Half Barrel Bookcase made from real wine barrel. Made from aged oak wine barrels, previously used in wine production for anywhere from 2-5 years. 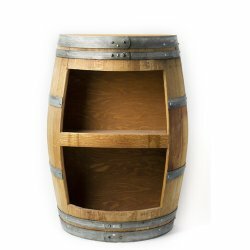 100% recycled barrels - Help the planet and store your wine, books or other valuables in this unique display! These hand-crafted products are made from premium French oak barrels. They once produced the finest wines and now form a unique collection in your own home. Please note, the barrel has been cut in half vertically and this bookcase is designed with flat back to be positioned against a wall.